There are several ways to insert chord grids into your score. Drag a chord grid symbol from the Part box into the score. Choose a chord grid symbol in the Part box, then click in the Score Editor with the Pencil tool. 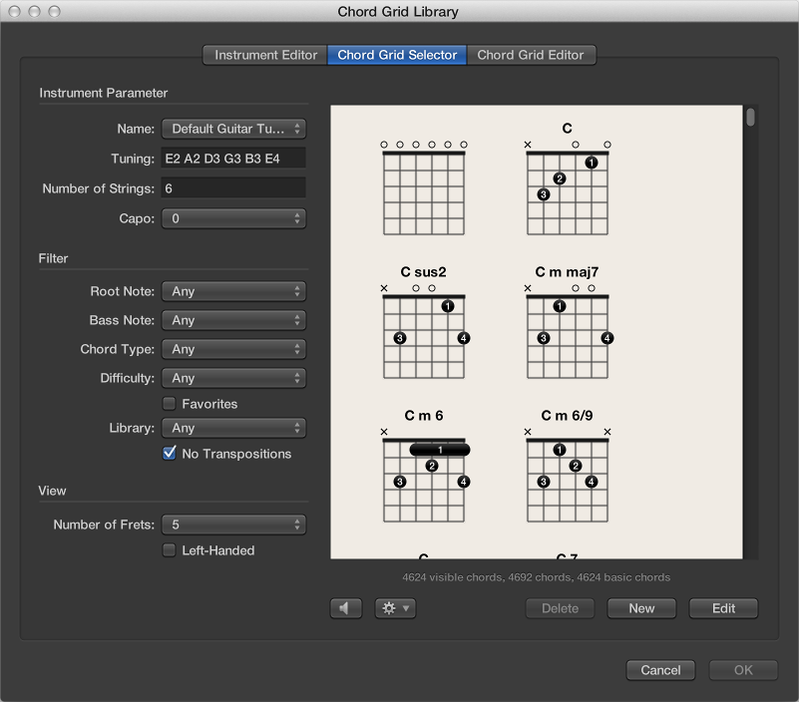 Either technique opens the Chord Grid Selector pane in the Chord Grid Library. Select a chord grid, then click OK.
After inserting chord grids in your score, you can edit their size and position accordingly. The scaling values are based on the Grid scaling and Chord scaling settings in the File > Project Settings > Score > Chords & Grids pane. 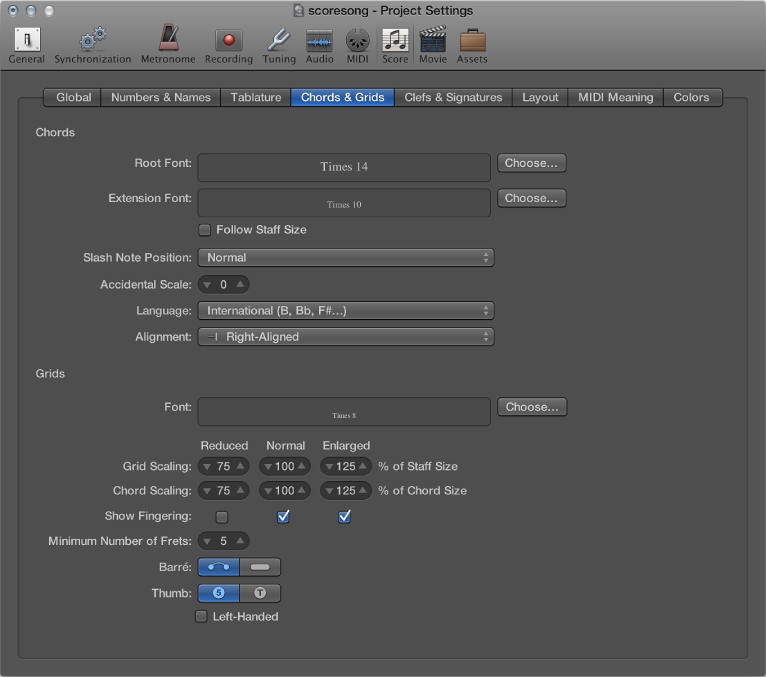 Select multiple chord grids, Control-click any one of them, then choose Align Object Positions Vertically. The selected chord grid symbols are aligned vertically. Control-click a chord grid, then choose Align Object Positions Vertically. You’re asked if you want to align all similar objects to this one. Click OK.
All chord grids are aligned vertically. 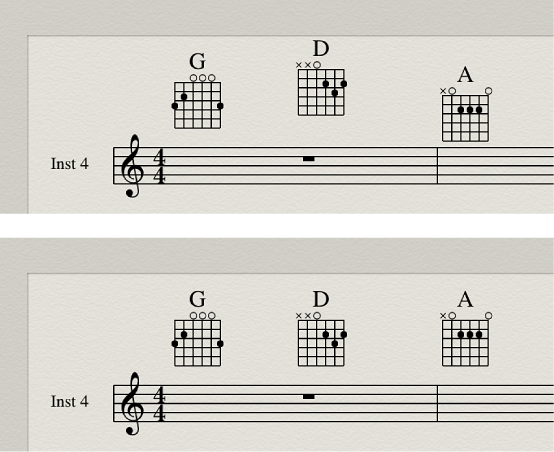 Hold down Option while dragging an existing chord grid, then release it when you reach the desired position. You have the option to hide or show the chord name on a chord grid. Control-click a chord grid, then choose Hide Chord Name from the shortcut menu. Double-click the chord grid, choose another in the Chord Grid Selector, then click OK.